Replacement for Scythe's best-selling flagship cooler, the Ninja. The Ninja II has 5-15% better performance and can be used without a fan for absolutely silent operation. The original Ninja was well known for being one of the best heatsink around and now Scythe have developed their latest version, the Ninja II. As you would expect the Ninja II performs better than its predecessor, in fact Scythe state it performs 5% better in fanless mode and up to 15% better when used with a fan! This increase in performance is primarily down to the re-design of the fin shape and pitch - this mean that one of the best has just got better! The Ninja represents the holy grail of a quiet computer because it can be an entirely passive heatsink, so from a noise point of view it is totally silent. It manages this through its clever arrangement of a multiple-layer fin design, combined with no less than six heatpipes. 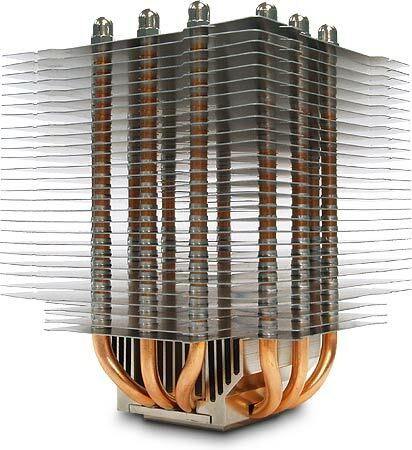 Because of this, it is one of the most efficient heatsinks we sell. The downside of this design is that is makes the heatsink fairly large, meaning that it is unsuitable for use in restricted-space applications such as HTPC cases. When used as a fanless cooler, the Ninja is restricted by the type of CPU you are intending to use with it. We recommend using this cooler fanless if your CPU outputs less than 65W, like Intel's and AMD's dual core processors. If you intend to use the cooler with a quad core processor then we recommend you install the supplied 120mm fan. The Ninja II is supplied with two retaining clips and a Slipstream 120mm fan for use with high-end CPUs. It is imperative that after installation you monitor your CPU temperature very closely, making sure that you are happy with the results. If you believe your CPU temperature is too high (say 65C or above), try to increase the airflow through the system. If the CPU temperature is still too high then please cease using the Ninja and contact us for advice. However, as long as you do not run your PC with the CPU flat out for many hours continuously, there should be no reason why you can't enjoy the silence of this cooler. Alternatively you can always use the supplied 120mm fan to provide direct airflow to the heatsink; And if you purchase Zalman's Fanmate 2 at the same time you will be able to adjust the speed of the fan to give you the best balance between noise and cooling. I bought this to reduce the noise in my low power computer that is on 24/7, the stock AMD fan was a bit noisy. Installed this with a Fanmate to reduce fan speed to 500rpm and now the laptop hard drive is now the only audible component (soon to be replaced with SSD). I would definitely recommend this cooler. Astonishingly good performance for a fanless cooler, this thing really is a miracle! It's running a 65W CPU in a case with no airflow and no fan and it's still keeping it below 45C. Couple of things to watch out for though, the edges of the heat sink plates are like razors, my PC now has an interesting dried-blood motif on the case. The other is, Don't do what I did and assume that just cause you have a full-tower server case, it's bound to fit, this thing is HUGE!, get a ruler and check! I purchased the Ninja II in order to reduce the noise from my PC, when fitted; the only noise is from the CD / DVD drive. It needs to be heard to be believed, or not as the case. If you are seeking a quiet life, fit a Ninja II.